When you have a quality project underway, you need accurate and timely information to track its status and make decisions on the fly. With QLS Dot that process is simple and efficient. All project information is available online in a secure database accessible at the touch of your laptop, tablet or smartphone. All screens are totally responsive to your device size. We know, for example, that over 30% of our clients are accessing their project information on smartphones. We call this online service Dot because it is focused on resolution. 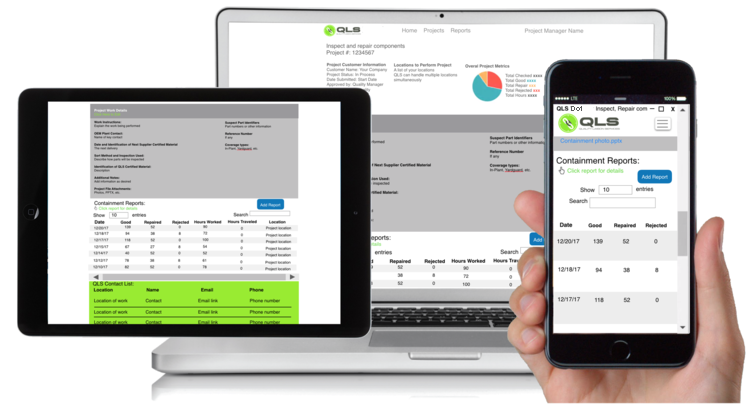 When you have an issue, QLS is on it -- from initial notification to fully documented resolution, QLS clients have 24/7 access to the project's status. Ability to attach photos, spreadsheets, PowerPoints etc. Part identifiers explained by lot, part number, etc.